It’s not quite spring yet, but I’m optimistic; once the winter holidays are over in my household, I only look forward. In the actual fashion schedule, of course spring was a long time ago; Spring 2014’s New York Fashion Week was back in September. And along with that came the color trend forecast from Pantone. Pastels meet vivid brights, in what the Pantone Color Institute director describes as “a state of thoughtful, emotional and artistic equilibrium.” By which they are saying that the soft pastels over on one end can mix with all the others, but also serve as backgrounds, while the brights balance them out – often with the helpful use of the two bridging neutrals. 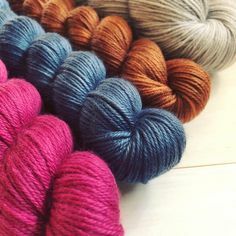 Speaking of those neutrals, the Paloma grey is pretty much my all-time favorite color, so I’ll be eagerly continuing to use it both alone and with everything else. The sand is a toasty camel that’s going to help me adopt something other than grey as a neutral; there’s a cardigan design using Apple Cinnamon in Malabrigo Worsted that I need to get back to. What I love about the pastels Violet Tulip and Hemlock – and also the men’s versions in Purple Haze and Comfrey – is the way the saturation is greyed down a bit; sure, it’s spring, but that doesn’t mean we have to crackle and pop with eye-burning chroma. Those four colors in particular represent to me the “other neutrals” Pantone is talking about. Both blues can fill that role as well – there always have to be blues, which are perennial favorites – just not so much mine, unless it’s a real cobalt. The warm pop colors of Freesia, Celosia Orange and Cayenne play well with the others, and if you take the middle of the range as I laid it out, it’s a real tequila sunrise – wait for early summer, then put those fiery colors together with the purple, and order up a tropical drink. I might be most excited about the fact that purple is so heavily represented ; if you don’t count grey, that’s my favorite color. Of the purples, the color of the year Radiant Orchid is my least preferred; even though a recent tour through my closet made me realize that perhaps reddish purples actually hold more charm for me than blue purples. This one is a bit chalky, though (more on that next time when I spotlight it). But the men’s version Magenta Purple is amazing – yes, for women and for spring; picture it with the soft pastels. Magenta and mint, or sky . . . very striking! And the bluesy ones, the vintage-y Violet Tulip and the men’s version Purple Haze – love them with anything. 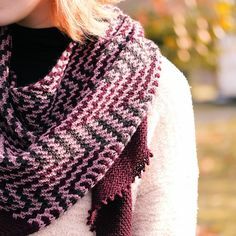 Soon I’ll give a little sneak peek of my new violet-magenta-bluesy plaid that’s going to be a new sweater pattern. As these colors trickle down through all levels of the market, it’s going to be a good shopping year.